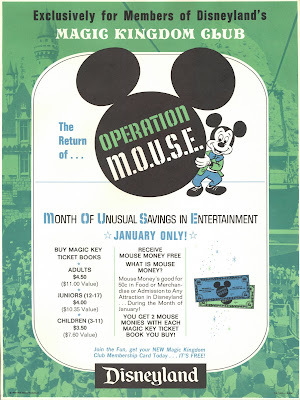 This flyer promoting Operation Mouse was from at a post back in January 2009 (link). Right after I posted the flyer in 2009 a blog reader contacted me and we made an exchange. I got myself a real Operation Mouse Money 50¢ coupon thing (link). As an added bonus it’s on that wonderful “castle and star” paper. Notice the expiration date in 1969; these were literally “January Only”. 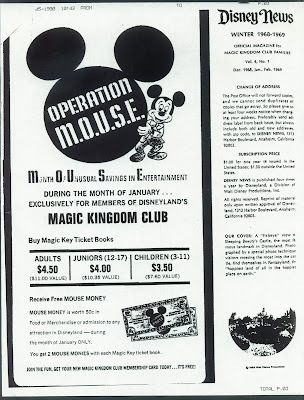 Another great blog reader recently sent me some great scans of more Operation Mouse Money, thank you Mr. Disney Dollar collector! This copy from Winter 68-69 Disney News came with the coupons. Wow, a couple interesting things to note here. First, these are two different colors than my sample above? And neither one matches the colors of the samples in my flyer at the top? What gives? Notice the expiration date; 1968? My flyer is dated 12/68 clearly intended for January 1969. These “voids” have very low serial numbers; maybe these were tests done earlier in 1968 so it made sense to print 1968? Or maybe they did this promotion in 1968 as well as 1969? Jason, what’s the database got say on “Operation Mouse”? Very cool to have that unvoided example with the castle and stars paper! You bring us the coolest stuff! Is anyone willing to sell their operation mouse money? I would love to have one in my collection! Thanks!